The sleeves of this crochet jacket pattern are 25 stitches around so you might be able to use that as a guideline for both size and yarn choice. One color or two may be used for making this pretty crochet jacket, which is extremely modish, and very comfortable for the cool days and evenings sure to be experienced during summer outings. Six skeins of fourfold Germantown will be sufficient; or four skeins of one color for the body and two of white for the border, if made in two colors. Make a chain of 54 stitches, turn. 1. Miss 3, a double in next, * chain 1, miss 1, 1 double in next; repeat from * across, making 26 doubles; turn. 2. Chain 2, a double under 1 chain, * chain 1, a double under next 1 chain; repeat across, turn. Repeat 2d row until you have completed a strip 22 inches long, for the back, bringing the work to the shoulder. Now work back and forth for one shoulder and front, repeating 2d row until you have made 9 doubles; turn, chain 2, and repeat until you have made 4 rows. In the next row widen by making 2 doubles, 1 chain between, in center of row, finishing row as usual; widen in the center of every 8th row until you have 15 doubles in the row, then continue without widening until the front is of the same length as the back. Leave 8 doubles for back of neck and on the remaining 9 doubles work the other front to correspond. For the border: Commence (with the border-color, if two colors are used) at corner of left front, make a treble under 1 chain (chain 3 for 1st treble), * chain 1, a treble under next 1 chain; repeat from * all around, putting 2 trebles with 1 chain between in same stitch at corners, and on the shoulders at the neck to shape the collar. Make another row in the same way, then work in seed-stitch as you did the body of the jacket (a double under 1 chain, chain 1) for 8 rows, widening the same stitches at corners each time. Fold the crochet jacket at the shoulders, bringing fronts and back together. Commencing in 10th chain from bottom of front and back, work in the usual way for 25 stitches, a double under each chain. 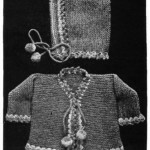 Work from underarm around the armscye until the sleeve is 12 inches in length, or as long as desired, then make the 2 rows of spaces, in treble crochet, as before and finish with 7 rows of seed-stitch, same as body of jacket. For the picot edge: Two doubles in 2 stitches, chain 3 for a picot; repeat. The stitch given is very simple and pretty, but any other fancy stitch may be used that is liked. 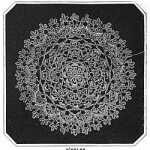 Among others may be named Lancaster-stitch, made as follows: Having a chain of an even number of stitches, turn. 1. Miss 1st stitch, a double in each remaining stitch, turn. 2. Chain 3, wool over, draw a loop through 1st stitch, over, draw a loop through next stitch, over, draw a loop through same stitch, over, draw a loop through next stitch, over, draw through all the loops on needle, * chain 4, a double in 1st stitch of the chain just made, which closes or joins the cluster of loops, over, draw a loop through same stitch with last loop of preceding cluster, over, draw a loop through next stitch, over, draw a loop through same stitch, over, draw a loop through next stitch, over, draw through all the loops on needle, and repeat from *; turn. 3. A double in 1st space, double around the thread between 4 chain and cluster; repeat, ending with a double in top of 3 chain with which last row started. Repeat 2d and 3d rows for the pattern. The bird’s-eye-stitch is simple and pleasing: Having a chain of desired length, turn. 1. 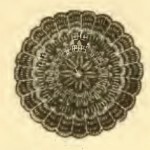 Miss 1, a double in each stitch of chain, turn. 2. A double in double, taking front loop of stitch in last row, a double in next double, taking back loop; repeat to end, and repeat 2d row. Still another pretty stitch, easily adjusted to any garment, is as follows: Chain a number of stitches divisible by 3, turn. 1. Miss 1, a double in each remaining stitch of chain, turn. 2. Chain 1, a double in each double of last row, turn. 3. Chain 1, a double in each of 2 doubles, * wool over, insert hook in 3d stitch of 1st row, take up wool and draw through, (over, draw through 2 stitches) twice, miss 1, a double in each of next 2 doubles; repeat from * to end of row, turn. 4. Same as 2d row. 5. Chain 1, a double in each of 1st 2 doubles, * wool over and make a treble as before, inserting the hook under the treble of 3d row, miss 1, a double in each of 2 stitches; repeat from * to end, turn. Repeat 4th and 5th rows. And another still: Make a chain of length required, turn. 1. Miss 3, a treble in next stitch, * miss 1, 2 trebles in next stitch, repeat to end of row, turn. 2. Chain 3, 2 trebles between each group of 2 trebles in last row; repeat. Repeat 2d row. I have been looking around for a pattern for a cardigan/jacket and I think this may be the sort of thing I’ve been after. I shall let you know how I get on!! Should be interesting. Thanks for sharing the patterns. I am so glad that you found a pattern on The Crafty Tipster that you like. Please do let me know how it goes. I would also love to see a picture of your finished sweater! Thank you for visiting my site and please come again as I have quite a stash of vintage patterns yet to be added.